It is a yearly taste treat. When the Harvest Moon shines bright and big – the time for mooncakes has arrived. It is a must! 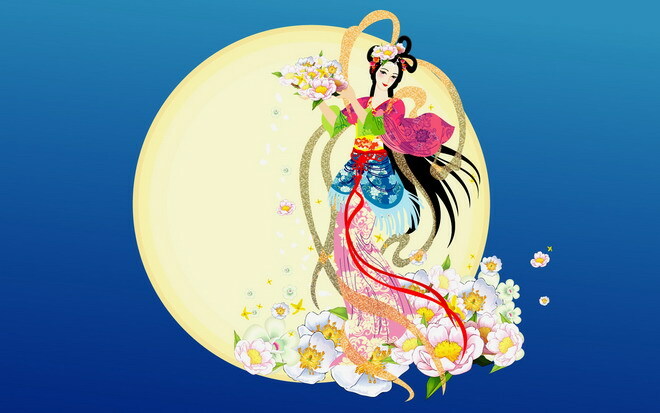 The Moon Festival or Harvest Moon Festival, is a celebration in the spirit of gratitude, associated with the full moon. This holiday is an observance of the harvest, a time of thanksgiving, and joyful reunions with loved ones. The Mid-Autumn Festival is one of the three big annual holidays in China – the other two celebrations are Chinese New Year and the Dragon Boat Festival. The Moon Festival (it has several names) is held on the 15th day of the 8th month of the lunar calendar with a full moon at night. Thereby it’s equivalent is late September to early October. The origin of the Harvest Moon Festival has several stories behind it. Probably the most famous and widely accepted tale is the romantic folklore about the lovers Hou Yi and Chang’e. Please note: there are a few different versions of the following story. As a skilled archer Hou Yi earned an elixir of immortality from the Jade Emperor for helping save the planet. There had been 10 suns in the sky burning the earth and Hoy Yi shot down 9 suns thereby saving the planet and the people. He was bestowed an elixir of immortality and subsequently gave to his wife Chang’e to keep safe within their house. One day while Hou Yi was out hunting – a bad guy, Peng Meng, came to steal the potion. Chang’e realized that she could not defeat this enemy – so she drank the immortality elixir herself. When she drank it, Chang’e flew out of the window, higher and higher, into the sky. Her great love for her husband drew her towards the Moon, the nearest place to the earth so she could live nearby her husband. Upon receiving the news, Hou Yi was very sad of what had happened to his beloved wife Chang’e. He then took a table outside into the yard and displayed the fruits and cakes Chang’e had enjoyed and in this way, he gave sacrifices to his wife. To this day, it’s believed that Chang’e lives on the moon, longing for her husband. Many children in China believe that Chang’e is still living on the moon. And during the nights of the Mid-Autumn Festival, when the moon is bright, children try to see the shape of Chang’e on the surface of the moon. Mooncakes are the signature pastry of the Mid-Autumn or Harvest Moon Festival. The mooncake is a dense round cookie with various fillings and different artistic patterns on the surface representing the legends of the festival. When I say dense – I mean really thick and solid. It is the custom to present mooncakes to friends and relatives for good wishes. And of course, we eat them as a celebration. Mooncakes are thick and chocked with calories. It is always best to cut and eat in small bites. For example, a lotus paste mooncake = 716 calories. But hey, remember – this is a yearly foodie event. It’s not an everyday thing – so cut yourself some slack and indulge! Most mooncakes need to be eaten fresh. Or they may have an odd oily taste later. This doesn’t include the mooncakes that are shrink-wrapped or the refrigerated modern style. 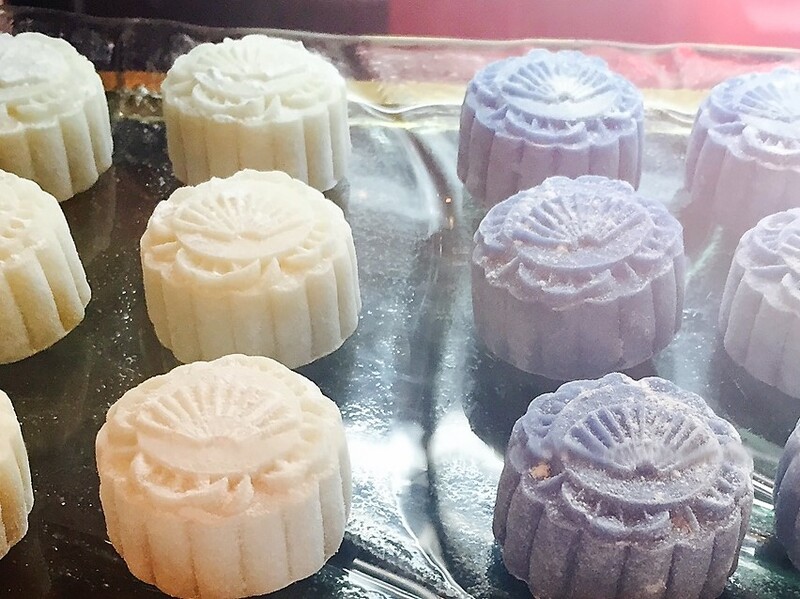 There are so many types of mooncakes depending on the place of origin – it could be a Beijing-style, Guangdong-style, Suzhou-style, or Yunnan-style. And there are different flavours and crusts and fillings. The inside of a mooncake may contain lotus seed paste, red bean paste, white lotus, double or single salted egg yolks, macadamia nuts, osmanthus, or melon seeds. These days, there are so many varieties of mooncakes with modern styles – you can not even imagine. Bakeries and hotels all over the world have gotten on the bandwagon to create unique specialty mooncakes. These contemporary styles of mooncakes have added in all kinds of ingredients. And the gorgeous packaging with beautiful boxes and selling of mooncakes has become a big business during the fall months. Corporate gifts are given as well as the family and friend gifts. Many cities outside of China – from Hong Kong to Singapore to Kuala Lumpur to San Francisco and more – all offer their specialty mooncakes. Here is a partial list of some mooncakes and their exceptional amazing ingredients. Matcha flavoured mooncakes – Azuki bean filling made with the best produce from the Togachi district of Hokkaido, Japan – Yam Moon Cake with Single Yok – Cranberry Cheese – Pu’er tea-infused crust mooncakes >> OMG = I adore Pu’er tea 😊 – White Chocolate Passion Fruit with Mango – Champagne and Strawberry – Whisky Chocolate Mooncake – Tangerine Lemon with Matcha Red Bean Paste Snow-skin Mooncake. On a note of bling: I have heard of a luxurious mooncake that uses high-quality coffee beans and VSOP Cognac, and decorated with a thin layer of white chocolate and shimmer of gold leaf. If you are watching your sugar consumption – there low sugar options of mooncakes. And If you’re looking for a healthier mooncake option, there are trendy places worldwide. These hip places use seaweed sugar and other unique creative ingredients. One of my hometowns is San Francisco. If you are ever there – you must visit Chinatown. Who knows what it looks like today because it has changed over the years as everywhere has. Most important is that if you are in SF for the mooncake time – you’re in luck. There will be a Harvest Festival and there are many bakeries with fresh wonderful mooncakes. Eastern Bakery was my chosen spot. Each and every year and in between = whenever I was in Chinatown – I would visit the Eastern Bakery. 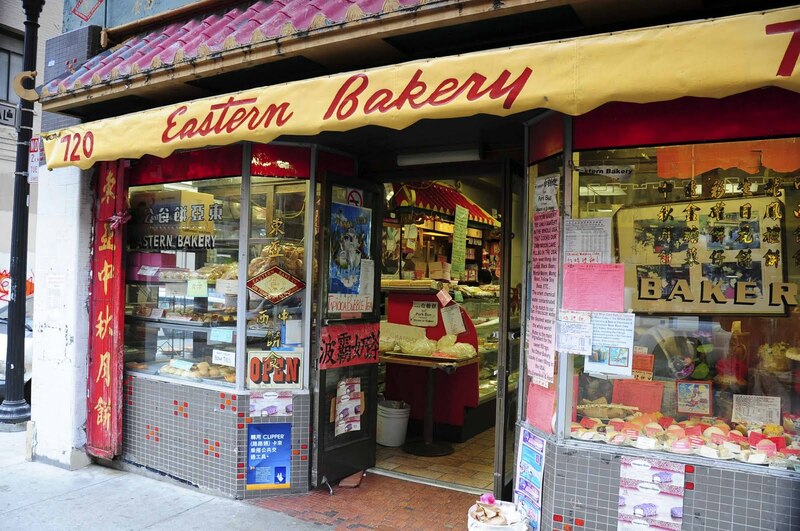 On the streets of Chinatown San Francisco – Eastern Bakery has been around forever. It is an icon. A visit here is reminiscent of dreamy hints of Shanghai girls biting into warm coconut cream filled bread. During the Harvest Moon Festival time, Eastern Bakery offers all the traditional varieties of mooncakes such as Yellow Soy Bean – Winter Melon 2 Yolks – Black Bean – No Yolk Mixed Fruit & Nuts – Mini Mooncake – Fish Moon Cake – 4 Yolks Lotus Moon Cake – and more. I have heard that the Eastern Bakery has the best coffee crunch cake in the Bay Area. Make a note of this. I have. It’s on my ‘when I get back to SF list’ to stop in and try. My final words are: the best way to eat a mooncake is in small wedges and with a cup of tea. I always buy both – the traditional and the modern version mooncakes. The Durian Snowskin Mooncake is my favorite of the modern style mooncake.